My dream of squeezing in a culinary excursion during an international layover came true during our flight home to Los Angeles. Rather than twiddle our thumbs for five hours inside the Munich airport, The Astronomer and I hopped aboard a local train in search of a proper German meal. With the airport located an hour outside of town, we had to hustle to get our grub or risk missing the second leg of our flight. Meals spiked with an element of danger are the best! 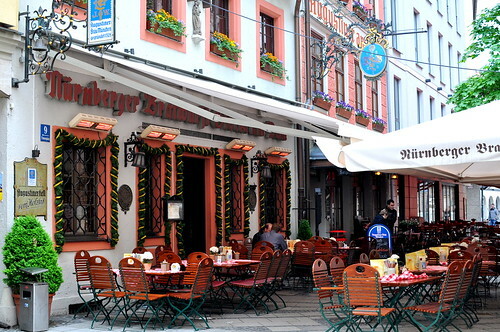 The Astronomer and I found ourselves at Nürnberger Bratwurst Glöckl am Dom based on a Frommer’s recommendation naming it the “the coziest and warmest of all local restaurants.” The place has been around since 1893 and was rebuilt after World War II. The cottage-like interior was adorned with dark wood furniture and colorful bric-a-brac. A small army of traditionally dressed barmaids worked the room, serving sausages and beers to a steady stream of patrons. The entire scene was straight out of the Oktoberfests of my youth, minus the whole frat brother/meat head vibe. …while I indulged in way too many soft pretzels slathered with sweet and spicy mustard. 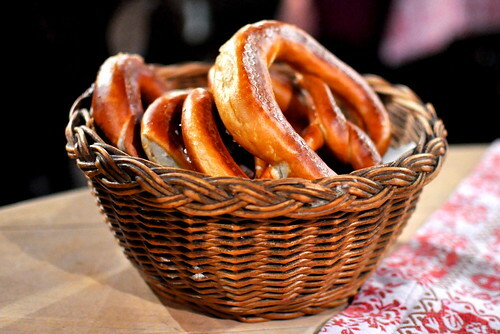 Wouldn’t it be grand if all restaurants offered a basket of freshly made pretzels tableside? Now, that would be dreamy. 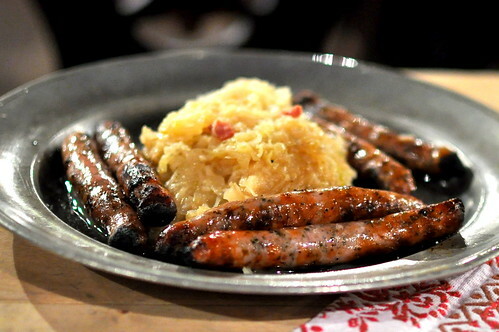 The first course to arrive was the restaurant’s famous pork sausages with sauerkraut (unsere weltbekannten Rostbratwürst`l – 7.95€). Made from coarsely ground lean pork, the sausages were seasoned with marjoram, salt, pepper, ginger, cardamom, and lemon powder. Served fresh off a wood-fired grill, the skinny little weenies were fabulously flavored and seriously snappy. 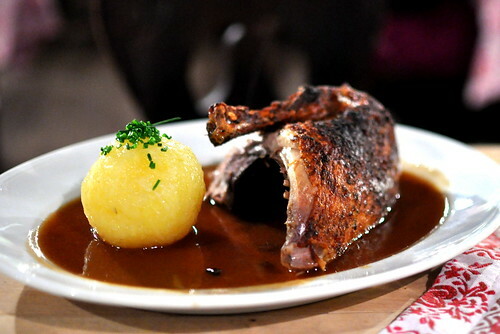 The Astronomer’s main course was a quarter roasted “farm duck” with red cabbage and a potato dumpling (1/4 Portion Ente mit Blaukraut und Kartoffelknödel – 11.50€). The duck was perfectly cooked with crispy skin and moist meat, while the stewed red cabbage was tender and sweetly spiced. The only disappointing element on the plate was the potato dumpling, which was bland and sat like a rock in our stomachs. The cold Munich weather put me in the mood for a bowl of soup. 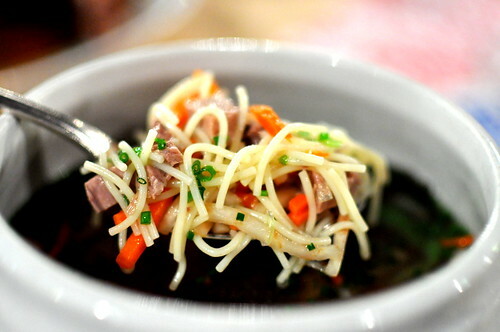 I settled on the noodle soup with ox meat served in a terrine (Große Portion Nudel-Ochs in der Löwenkopfterrine – 6,50€). Each bite was warm and inviting, just like the surroundings. And even though we were already super stuffed, I insisted on ordering dessert because it’s not every day that we find ourselves in Germany. 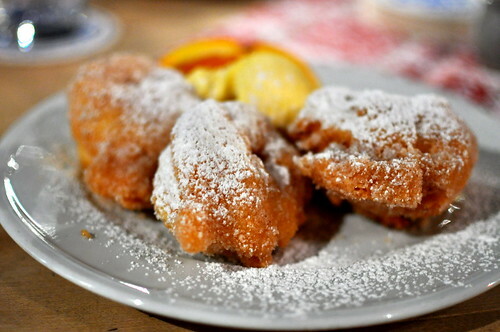 The deep-fried apple doughnuts with cinnamon-sugar and vanilla ice cream (Apfelkücherl in Zimtzucker mit Vanilleeiskrem – 6.50€) were straightforward and well-executed. My layover excursion was everything that I hoped it would be. I saw some of the city, tasted the local offerings, and chatted with a few locals. My snapshot of Munich was an extremely positive one, and I hope that my travels take me back here in the future. And just in case you were wondering, The Astronomer and I made it back to the airport in plenty of time to go through customs and board our flight. I’m so glad you had the opportunity to nip over to a restaurant in Munich. And I couldn’t resist commenting here because: we returned from a trip to Europe which included southern Germany since that’s where my partner is originally from a long time ago. From the area 30 kms. east of Strasbourg, France. 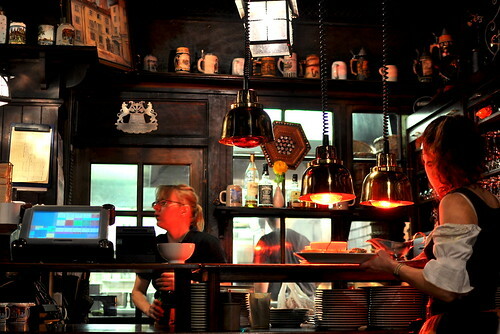 So the German cuisine there is more light-handed and with a French influence. Also area where famed German wines are produced. I wrote a few recent food blog posts within my cycling-travel blog. And there’s another post on how to evaluate cake quality in Europe (and North America). If you get the opportunity do try sauerbraten, usually beef with wine and vinegar sauce. A slight tang. It’s good. Also spaetzle, hmmmmmmm but my partner makes it with herbs. And genuine soft pretzels that have the lauben…no sugar used in making it. And no butter used. Very healthy, yet delicious. Always buy and eat them on the same day if baked, if you can. wowzers…you are adventurous. a 5 hour layover for me usually means walking around the airport groaning and sighing and perhaps getting a little tipsy. your plan sounds a lot better. 5 hours well spent! Man those sausages look righteous! Thanks for the offer MinMin! I will hit you up next time. I am glad to hear you enjoyed all the good stuff in Muenchen. However, you should have eaten the Weisswurst in Muenchen and when you go to Nurenberg, each the Bratwuerst, this is where they are the best. A few hundred years ago when they were inspected every day before the butcher could sell them and they were not exactly like the recipe prescribed, they were thrown into the Pegnitz. Just got back from Germany. Of the places we ate at in Munich, this is how we ranked them. We enjoyed all of them them, except Augustiner. 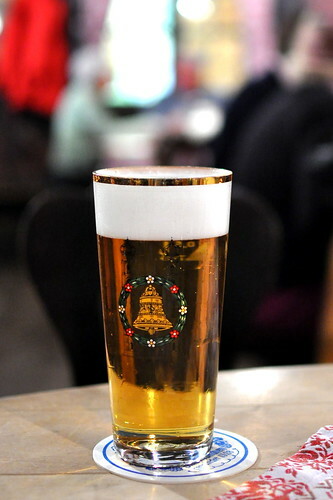 However, after a few brewhouses, we were ready to try some new cuisine.